Planning a spring bathroom makeover? Explore some color schemes that have the power to transform any bathroom for a truly fresh spring start! You are tired of the look of your bathroom and want to give it a facelift for the spring? 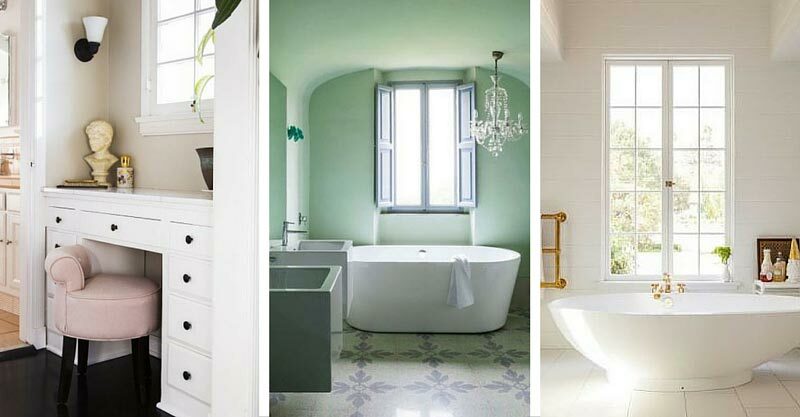 For the spring , for a clean, refreshing bathroom look, opt for calming mint or pastel pink. Another trendy option is to go all-white for a definitely crisp, modern, elegant bathroom. If you don’t like any of these ideas because you want to lend your bathroom a bold look using bright colors, then, curate the colors so they complement one another. Get creative, sometimes only a coat of paint or some accessories in trendy colors can do the job. Are you ready to give any of these four color schemes a try? Mint is a calm, soothing color which works beautifully on walls and ceilings. It evokes a cool, fresh feel. In addition, it pairs well with white to boost the soothing effect. 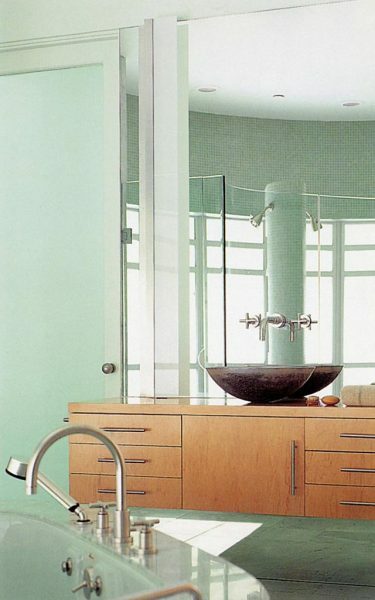 This bathroom with mint walls feels so fresh and inviting, don’t you think? Gorgeous tiling and square sinks add to the appeal of the space. A floating shelf adds storage and display space and visual interest. Oversized mirrors create a sense of space. A crystal chandelier brings in sparkle and touches of luxury and sophistication. Definitely, this is a fresh, elegant bathroom with a distinctive architectural character and tons of personality. Note that mint also works well with neutral tones (like the warm glow of wood). 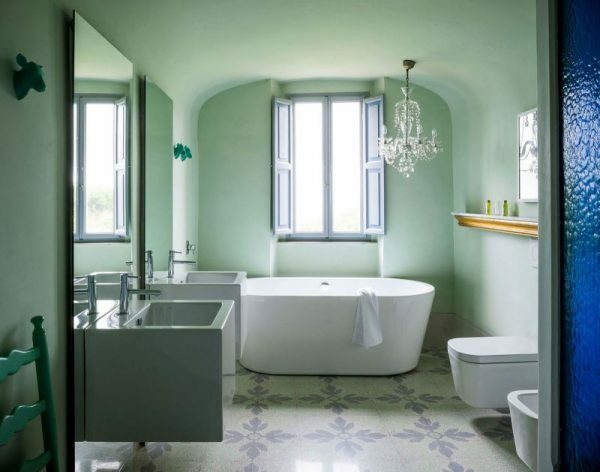 Mint-colored mosaic tiles make this bathroom the perfect retreat where to unwind from a hectic day. Natural wood adds warmth and lends the space an organic vibe. a unique vessel sink brings in visual interest and personality. This appealing contemporary bathroom is an example how mint and natural wood complement each other and lend the space a lovely, fresh look. However, if an all-mint bathroom is too much for you, try to introduce the color by adding it to the shower zone or create an instant springtime vibe by throwing in some mint green accents. For this spring, try with white pastel pink and use color to complement crisp white or textured cream tones. Bringing in a hint of green is always a good idea, so introduce some greenery to create a fresh, appealing space. 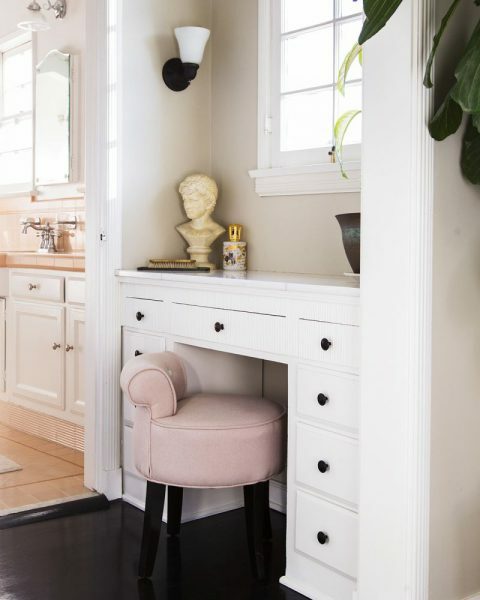 In this traditional bathroom, a pastel, milky pink stool adds so much femininity and sophistication. In addition, potted greenery brings in freshness and lends the space an organic feel. If you’re not sure about pink, you can always start with one accent item. Bathmats, towels, and soap dishes are options to both introduce pops of pink and add texture and visual interest to your bathroom. For a truly fresh and crisp bathroom, go all-white and add a dose of greenery to celebrate the return of spring! 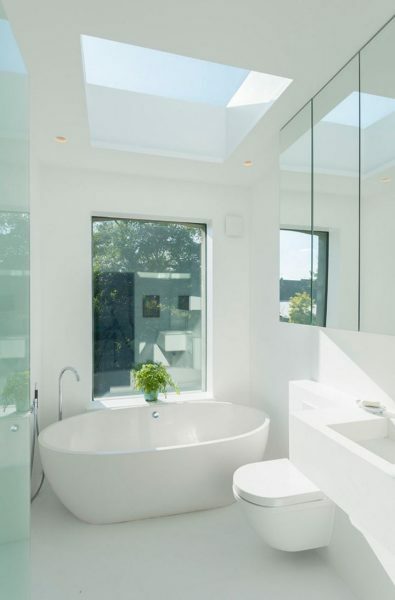 In this minimal yet elegant all-white bathroom, a skylight adds extra natural light and a large mirror and glass door create a sense of space. Definitely a striking contemporary bathroom, don’t you think? Also, If your bathroom has a view, white is always the best option because it serves as a neutral backdrop for the natural beauty just outside the window. Other gorgeous spring options for all-white bathrooms are adding brass accents, white marble tile, and sculptural plants in white containers. Brass accents add warmth, glam, and touches of whimsy and modernity to this fantastic all-white bathroom with a distinctive architectural character. An oversized paneled window offers adequate natural light. A gorgeous freestanding tub and a pair of matching eye-grabbing sconces complete the look of the space. An elegant vase of flowers brings in freshness and accessories – color and extra visual interest. Definitely a fantastic bathroom! When it comes to all-white bathrooms, consider using draperies, cushy seating, and plants to add warmth, color, texture, and visual interest. Another trendy way to create a fresh spring bathroom is incorporating bright colors, which complement one another to lend the space a bold look. Opt for groupings of modern artwork, geo patterned wallpaper, or rugs, as they all are easy, affordable ways. 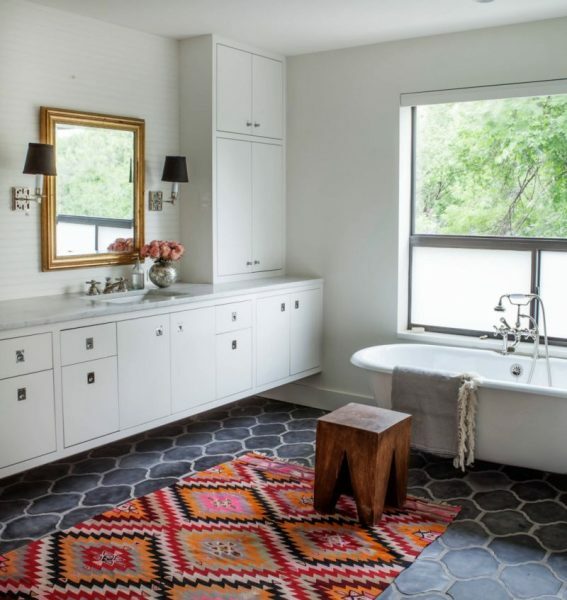 In this bathroom with adequate natural light, crisp white walls, custom made white cabinets and gorgeous floor tiling, a Moroccan area rug and a wooden stool add warmth, vibrancy, visual interest, and an organic feel. A pair of matching sconces provides task lighting. A stylish vase with a charming bouquet adds extra color and freshness.